Difference between revisions of "Compare Word Documents"
The current plan is to ship this bundle with Eclipse 3.5. However, the bundle is compatible with 3.3. You can download the built bundle from here and put it in the plugins directory of you Eclipse install. The source code will be added to CVS once HEAD is opened in for 3.5 development. 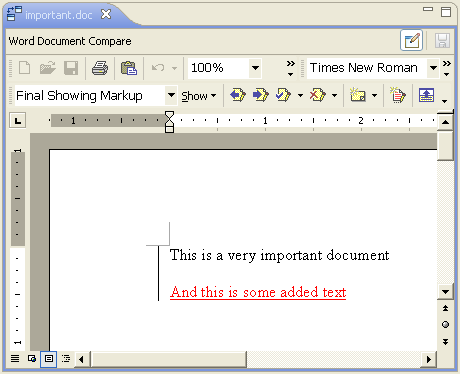 In this section, we describe what our goals for the Word document merge viewer were. We then described the features of the viewer and show some screen shots of what the result looks like. We don't have a screen shot of the window since it is simply a full blown word application. Notice that the "In-place" toggle button in the above screen shot has been changed from the previous screen shot. Also notice that the editor is now dirty and the save action in the toolbar is enabled. The editor is dirty because we have made changes using the Word application. Even thought the document is shown in a separate window, we are still keeping a link to the document so we know when it has been modified. 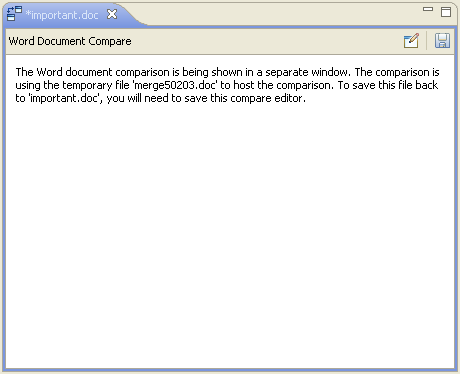 Saving in the compare editor will still work (as indicated by the text that appears in the compare viewer). A limitation of the viewer is that it doesn't offer the ability to save if neither or both sides of the comparison are editable. For the "both editable" case, we didn't feel we could adequately present the save options in the UI. The workaround is to open the comparison in a separate window and you can then save any changes to any location on disk. We will now look at how to integrate a compare merge viewer into Eclipse. First we'll discuss the extension points we need to extend and then we'll discuss the compare viewer implementation. In this section, we look at how to define a viewer and embed it in the compare editor input. In the first part of the section, we will look at configuring the viewer. In the second part, we will look at interpreting the input to the comparison and how to write changes back to that input.